Kellyanne Conway alt-apologizes for her inauguration outfit by insulting American women. Kellyanne Conway has "apologized" to American women for her now-infamous inauguration get-up. And it's the most Regina George effing apology I have ever heard. 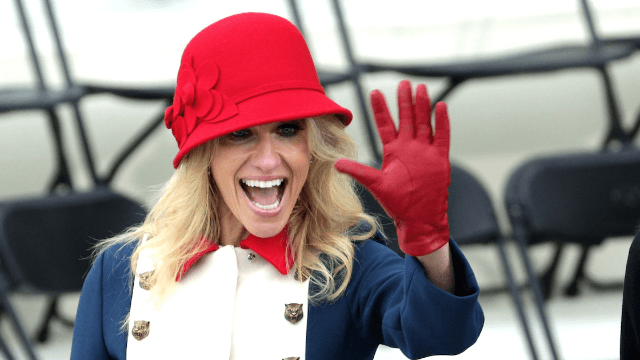 ICYMI: At Friday's inauguration, the Queen of Alternative Facts looked like a caricature of herself in a red, white and blue $3,600 Gucci double-breasted A-line coat, which she accessorized with a bright red bucket hat, matching gloves and handbag, People reports. Maybe it's because there weren't a lot of other people there, but the bizarre ensemble, which she described at the time as “Trump revolutionary wear,” attracted a lot of attention. Well, Conway has apparently taken time from her schedule of lying for the President to review the memes, and she has issued an apology. Only it's the kind of apology that isn't really an apology at all—an "alt-apology" if you will. In an interview with The Hollywood Reporter, Conway said she's “sorry to offend the black-stretch-pants women of America [by wearing] a little color." As a proud black-stretch-pants woman of America myself, I'd like to point out the irony of someone working for a white supremacist, Nazi-bating administration telling American women we are offended by "a little color." But in defense of Conway's "patriotic" outfit, at least it's a lot less ugly than everything else this woman has said and done since joining Trump's team. I'd even call it beautiful compared to that time she attempted stand-up comedy.